Holidays, business trips, round-the-world adventures… whatever kind of journey you're about to embark on, it pays to have the right kit… and the right kitbag to stow your stuff in. To help you we’ve rounded up 20 of our favourite items of luggage — from duffel cases so big you could almost sleep in them, to carry-on cases for those times when you really must get on and off the plane as fast as possible. Our favourite suitcase is the incredibly stylish Globe-Trotter - but what suitcase is right for you and your needs? There are all kinds of considerations here: budget, size, how long you’re going away for, security, longevity (how long you expect the case to last). In essence though you have three main choices: 1) A hard or soft case; 2) Two wheels or four; 3) A cabin-size case or larger? Hard or rigid cases – like the kind that Samsonite is famous for – are usually made from polycarbonate or ABS plastic. In theory, they offer better protection for fragile items and can withstand a reasonable level of abuse without damage, although some glossy-finished cases can get scratched all too easily. Hard cases are also generally more waterproof and secure than soft cases, although that obviously depends on the quality of the seals / locks / zips located around the case. Some of the better soft cases are waterproof too. The downside is that hard cases don't offer much in the way of flexibility bringing back holiday souvenirs along with all the stuff you took on holiday in the first place? The rigid nature of hard cases means you may not be able to fit your purchases inside. Having said that, some cases now – including the Samsonite Flux – do include some level of expandability, but even then they don’t have the flexibility that a soft case does. Soft cases, on the other hand, are flexible by their very nature – the sides of the case will bulge out to accommodate the extra items you’re trying to stow inside. They are also more likely to have external pockets for stowing additional items in and the best examples – such as the Eastpak Tranverz L – are also made from waterproof materials with waterproof zips, helping to keep the stuff inside dry. The flip-side is soft cases are more vulnerable to having their contents stolen, since they often rely on zip fastenings. However suitcases of either type often include 3-digit combination locks so you don't have to worry about losing an extra set of keys, and most are TSA-compliant – that is they are able to be opened easily by security at US airports should the need arise. Most suitcases come with either two sets of wheels on the base, or four. Which one you choose is largely down to personal preference. Two-wheel ‘puller’ cases are easier to manoeuvre in the real world of pavements and staircases where you can just tilt the bag and pull; Four-wheel ‘spinner’ cases are ideally suited to places with smooth floors, like hotel lobbies and airports where they get to glide around on all four sets of wheels – come across trickier terrain though, and you’ll have to drag them along on two wheels just like the others. Of more concern, potentially, is how robust and smooth-running the wheels are: ideally, they needed to be bolted (rather than riveted) to the case so they can easily be replaced if one does break, it also helps if they're recessed into the case corners a little – this makes them less vulnerable when they’re being tossed around by baggage handlers and have the advantage of making the footprint of the case slightly smaller. When you’re buying a case, you obviously need to think about why you're buying it, and what you’re going to use it for – you’re clearly not going to want to take a massive case with you if you’re going on an overnight business trip or a weekend away; but likewise you won’t want a tiny case when you’re off for a month in Kathmandu. For many travellers though, the most important thing is that they buy a case that can be stowed either in an overhead locker or under the seat in an aeroplane cabin – that means they don't have to hang around for ages in baggage reclaim, they can just grab their bag and go. Unfortunately there are no hard and fast rules on what constitutes a carry-on case; different airlines have different size and weight limits and what might be acceptable on one airline won’t be on another. It pays to do some research – and make sure any case you buy complies with size limits for your favourite carrier, otherwise you may find your suitcase ends up in the hold after all. Available in either Black or Pacific Blue, the Tumi V3 International Slim is the perfect carry-on case for a short trip away. It comes with four double wheels for stability, a telescopic aluminium handle and is lightweight at just 2.9kg. It’s also made from tough polycarbonate so should be able to clock up as many air miles as you do. The Tumi V3 International Slim contains three zipped compartments for safely stowing all your belongings, as well as straps for keeping clothes in place. The case is secured with a zip fastening too, with TSA-compatible combination locks for security. Unfortunately, the Tumi V3 International Slim isn’t perfect — there’s no side handle to help make it easier to stow in an overhead locker. That glossy polycarbonate shell also looks prone to scratching. And then there’s the price: £395 feels like a lot of money for a case like this. Rivals offer similar features for less. This compact hard shell case from British company, Antler, has been designed to be both lightweight and cabin-friendly, weighing in at 2.5kg (empty, obviously) and measuring 56 x 35.5 x 23cm. This means you can board on 27 different airlines and stow the bag in an overhead locker or under your seat — making it ideal for quick getaways at the airport or short stays away. Although it’s compact and lightweight, the Antler Juro 56cm comes with four bottom-mounted wheels and a telescopic handle for easy manoeuvrability. It also comes with 3-digit combi lock which is TSA ready for when you travel to the States. The Antler Juro 56cm should stand out on the baggage carousel thanks to its unique ridged design. Best of all, it comes with a generous 10 year guarantee. Eastpak is one of the most recognisable luggage brands, and this distinctive spinner case from America’s most famous luggage label is the result of years of innovation. For one thing, the Eastpak Tranzshell is available in nine different colours to suit your style. Our favourite is this distinctive Camo print. It also comes in three different sizes Small, Medium and Large, although we’ve chosen the smallest model here. The Eastpak Tranzshell also promises to be tough and long-lasting with a hybrid foam and fabric hard body, impressive 30-year warranty, and smooth running wheels on its base. It also comes with a comfortable padded handle so it's easy to move around. Inside it's just as smart, with two zipped pockets to keep your belongings in place during your travels. This case is reasonably light at 2.9kg, so for a short holiday or business trip away it’s ideal, especially given the large 32-litre capacity. It also includes a locking zip system with is TSA compatible. This premium carry-on suitcase by Smythson's, named for 'Greenwich Meantime', is designed to streamline travel without compromising durability. It's features specially designed wheels with a 360-degree rotation to create an almost weightless rolling experience. That's not all, there are leather handles on the top and sides to make the case easy to lift into an overhead locker, and the unique, bespoke, lacquered cotton shell ensures the bag is lightweight, hard wearing and water resistant. An exterior pocket makes it easy to access travel accessories on the go, a feature which we're sure you'll really appreciate. Inside you'll find ample space for short stays, with a detachable zipped compartment ideal for protecting electronics from toiletry spillages or keeping your laundry separate. Pair it with the matching briefcase for business trips or backpack on holiday. Available in black with a bright `Blue Butterfly`pattern interior, Ted Baker's stylish carry-on suitcase is a real designer piece with a distinctive, elegant look. Made from lustrous 900 denier twill material with rose gold highlights, the Albany also includes two smooth-rolling wheels in its base, plus large handbag-like handles. Inside the classy looks continue with a bright pattern, and plenty of room for your essentials. Other goodies include a 3-digit combination lock with TSA, and contrasting saffiano envelope style front pocket. 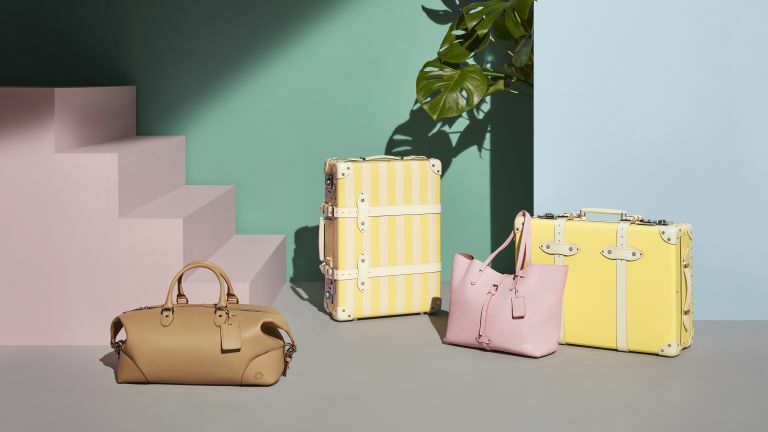 The Albany case is also available in range of other sizes – so whether you want a carry-on bag, or something larger for an extended trip away, Ted Baker has you covered. It’s cheap, but it doesn’t look or feel cheap - is this the holy grail of budget luggage? Well, quite possibly. From the luggage brand’s Revelation by Antler collection, the Amalfi four-wheel suitcase comes highly recommended from travel-happy reviewers across the web, with the words “sturdy”, “strong”, “light” and “manoeuvrable” being thrown around all over the place, proving that it if there’s that little extra wiggle room in the budget, it often pays to go for a recognised name. Oh, and it looks great too: not outlandish, but a standout. Looking for a durable and lightweight suitcase? This Samsonite luggage constructed from 100% Makrolon polycarbonate, it combines lightness, strength and reliability – ticking all the boxes for starting your travels right. In order to meet the needs of the frequent traveller, the Tunes interior is fully lined and comes with two zipped divider pads. The distinct design is finished in a high-end matte finish with refined silver accents. The fresh modern lining emphasises the balanced yet distinct overall design. The multi-directional 4 wheels and push-button telescopic handle offer smooth gliding through airports and city streets, and the case is fitted with a TSA padlock to allow US airport customs to check your luggage without damaging it. American Tourister is long-established luggage brand whose products come across like a younger, funkier Samsonite, offering a range of stylish suitcases at very affordable prices. You want a Star Wars or Minnie Mouse case? Then American Tourister will heed the call. This 67cm case, though, is fairly typical. Winner of a Red Dot design award, it’s a hard shell spinner case that nevertheless manages to be expandable too, stretching from 71.5 litres to 81 litres when fully loaded — and it comes in five bright and breezy colours that are guaranteed to make it stand out on an airport carousel, so too will its circular, vinyl record-like design. Inside the case the top compartment is zipped, with ribbons to keep your possessions in place, while the bottom half features ribbons only. The American Tourister Soundbox also includes a 3-digital combination lock that's suitable for travel to the USA (it’s TSA-compatible), although our main worry would be its wheels, which protrude markedly from the case bottom, making them vulnerable to damage. Horizn Studios is a trendy new luggage company, and its 'Model H' suitcase is one of the most stylish options you can buy (especially the Soho House version). It's strong, as well, engineered from aerospace-grade polycarbonate, so even if it's thrown around by the angriest of bag carriers it'll protect your belongings and instantly flex back to its original shape. This case is set on four 360-degree spinning wheels built by specialists in Japan and designed to be incredibly silent. The lock that secures the two-way zip is TSA-approved so you needn't worry about airport security. Every suitcase also comes with a one year subscription to Horizn GO – a personal travel assistant. So whether you're planning a trip around the world or on hunting for the hippest hangouts during a city break – Horizn GO sorts everything along the way. If you’re a corporate jet setter touching down for a meeting halfway around the world you don’t want a crumpled suit. Briggs & Riley’s baseline wardrobe case is designed to help you make a good impression as it’s shaped so you can ‘hang’ your clothes up, essentially folding them in half and stopping them from getting too creased. The interior also has a gusseted front pocket with a small section for keeping chargers etc, and a D-ring to hold hanging hooks, while the door panel has two mesh pockets for underwear, a zippered shoe pocket, a tie or scarf pocket, and another one for jewellery, tech bits or whatever else you like. The case is made from tough-wearing nylon that’s designed to repel water and resist scuffs and tears. It has four wheels to make it easily manoeuvrable when you’re running for a plane. It also comes with a lifetime guarantee. Whether you're off on a city break or travelling for business, Fabbrica Pelletterie Milano's 'Spinner' suitcase is a hardy and robust option. Not to mention, its bright aluminium case really looks the part. Inside you'll find two internal dividers, four leather straps, and zipped pocket to encourage neat and tidy packing, while the tough outer shell will keep everything safe and secure. For peace of mind, it fastens with combination and butterfly locks that can be used with or without the padlocks included. If rummaging in your luggage for a certain t-shirt, toothbrush or that bag of liquids you need to get out at the airport winds you up, this may be the case for you. Crash Baggage’s transparent medium suitcase is totally see-through, so you can see what you’ve packed before opening your case. While the case may invite the gaze of thieves if you carry anything too valuable in it, it promises to keep your belongings secure with TSA-approved locks and have an impact-resistant shell. There’s a removable laundry bag to keep your underwear private and to avoid airing your dirty laundry (literally), as well as a telescopic handle to transport it easily on the four multi-directional wheels. It’s a bold choice, but if you want to attract attention at the airport, the case will certainly manage it. If you’ve Marie Condo-ed your house and like your clothes organised, Antler’s Urbanite suitcase might be for you. It’s a light, durable upright case with multiple zip compartments to keep your bits and pieces in place and easily accessible. This 2-wheel suitcase can be carried in different ways with its variety of handles, from the zip-away pull handle at the top to the securely sewn webbing hand straps. And there are yet more straps inside to secure your clothes and gadgets, including a zip closure mesh compartment that’s ideal for underwear and small items. The case is great value for a large, durable design that comes with a three year guarantee. Ideal for longer trips away, the American Tourister Soundbox 77cm Suitcase is a large suitcase with a hard polypropylene shell and TSA-ready locks. The big draw here is that, rather unusually for a hard case, it is expandable on all sides, allowing for that extra bit of wriggle room when returning home with those holiday souvenirs. As this is a spinner case, it comes with four double wheels on the bottom as well as a double-tube handle for easy manoeuvrability. Its design is inspired by a vinyl record, and it'll certainly stand out on the luggage carousel. American Tourister Soundbox cases are available in a huge number of colours (but we prefer this mint green colour) and a selection of sizes as well. Ideal for longer trips away, the Samsonite S'cure ECO 75cm large suitcase with a recycled polypropylene shell and TSA-ready combi locks. Constructed using a minimum of 85% polyproplene, the core outside compartments are enriched with recycled wood waste. The interior also benefits from recycled materials, with the textiles engineered from 100% post-consumer PET plastic bottles. As this is a spinner case, it comes with four double wheels on the bottom as well as a double-tube handle for easy manoeuvrability. Internally, it comes with a bottom compartment with elastic cross ribbons for storing clothes, a zipped divider, and large side pocket. Samsonite S'cure ECO cases are available in a number of sizes: 55cm, 69cm, 75cm and 81cm, so there’s bound to be one that meets your needs. If you're planning on travelling in style, you need one of Globe-Trotter's iconic suitcases. The British brand's luggage has been carried by some of the world's most influential historical figures, including Captain Robert Falcon Scott, Sir Winston Churchill, and HM Queen Elizabeth II. This Trolley Case from the 'Centenary' collection is made from sturdy yet surprisingly lightweight vulcanised fibreboard, featuring smooth leather straps, polished silver hardware and a spacious canvas-lined interior. Yes, the Globe-Trotter Trolley Case is on the more expensive end, but when you consider it's been handmade in England, and will become a family heirloom, it's a lot easier to justify. Eastpak started life making canvas bags for the US military in the 1950s, and in the intervening years since it’s clearly learned a lot about making tough, lightweight, roomy bags for just about any need. The Eastpak Tranverz L is ahem, a case in point. First up the Tranverz L is a made from flexible, but tough polyester, which enables you to cram in a good deal more stuff than it’s 121-litre volume suggests. It also folds relatively flat when empty, yet can still stand upright when it is thanks to its carcass, which includes a double-tube extensible handle, with two recessed wheels in the base. One thing we love about this bag is that there are handles everywhere — making it easy to pick up from any side, while also making its bulk easier to handle as you can grab more than one handle at once. It also rolls easily on its big, smooth-running wheels. The Eastpak Tranverz L is available in 36 different colours — so doing its bit to stand out on airport carousels. It also has an incredibly smartly arranged interior, with zipped compartments top and bottom. It’s also relatively light for a big bag, weighing in at just 3.65kg. The bag's only downside is that it’s not particularly secure — you can make it so by attaching TSA-ready padlocks (not supplied) to its patchwork of zips. Sometimes only a huge suitcase will do — and this rolling duffel case from premium luggage maker, Briggs & Riley, fits the bill perfectly. Ideal for extended trips away, its huge 125.9-litre capacity is roomy enough for all your clothes, toiletries and other travel items. It comes with a removable metal frame to make the bag rigid when in use and comes with two main compartments — a duffel section, which comes with garment panels to minimise wrinkling, and a flat-packing section for other items. It also includes internal and external zipped pockets so you can keep the most important items close to hand. Despite its size, the Briggs & Riley Baseline Large Upright Duffel only weighs 5kg when empty and comes with two sturdy, smooth-running, recessed wheels and an external telescopic handle so you can pull it along. Further handles at the top and sides also make it easy to manoeuvre, while self-healing ballistic nylon and reinforced corners will keep it looking good for years — no wonder it comes with a lifetime guarantee. Having said that the Briggs & Riley Baseline Large Upright Duffel is fairly expensive. The zipped main storage compartment, is the only part that is lockable, although a TSA-compatible padlock is supplied. Constructed from a woven polypropylene material, Samsung's Cosmolite 2 case is strong but very light. Its shell-inspired ribbed design and textured surface also give it extra strength with no extra weight. The design is the luggage giant's best-selling design and one is sold every two minutes, so while this means you may see a few of these on the luggage carousel, they're a trustworthy choice with a 10-year guarantee. You can help yours stand out easily, as the design comes in a rainbow of colours and even limited edition designs, such as a Disney motif. The carry-on Cosmolite 2 has four wheels like its larger counterparts, and weighs in at just 1.7kg, making it easy to stash in the overhead locker... or better for a dash around Duty Free. And finally, we couldn’t possibly do a suitcase round-up without including the incredible kid-friendly cases from Trunki. Available in 22 different designs — including this limited edition Gruffalo one — the hard shell cases are designed to be ridden on and come with lots of neat touches, from 'seat-belts' (read: ribbons) for teddy bears and secret compartments, to ‘horns’ for children to hold on to while they’re pushing or being pulled along when riding the case. We also love the fact that these cases are affordable and hard-wearing, being made from the same material as adult cases. They're also sized to be able to used as carry-on bags – perfect for when your kids decides they must have their favourite toy at 30,000 feet.